"We are nobody's whipping boys" - Exclusive interview with Kevin Johns! He's one of the city's most recognisable faces, a film/theatre/radio star, and - most importantly - a lifelong Swans supporter... it's Kevin Johns of course! And it was my great pleasure to catch up with Kev this week to chat about his involvement with Jack to a King, the Arsenal game, Swans managers, and his passion for the club. Kev Johns - a true Jack through and through! Chris: It took me long enough, but I finally saw Jack to a King in October. What a brilliant film! I know you've seen it a few times, so what are your thoughts now the dust has settled? Kevin: I've seen the film five times and every time I watch it I see something different or I see somebody different. I can honestly tell you that I've not watched the film once without having tears in my eyes. And I often see people in there who are no longer with us. I saw the minister Caradog, who married my parents and did my Christening when I was a baby – he was a Swans fan and he sadly is no longer with us and there are others [who feature in the film] that have passed away. They would have all loved to see us where we are today. But I do see something different every time I watch it. 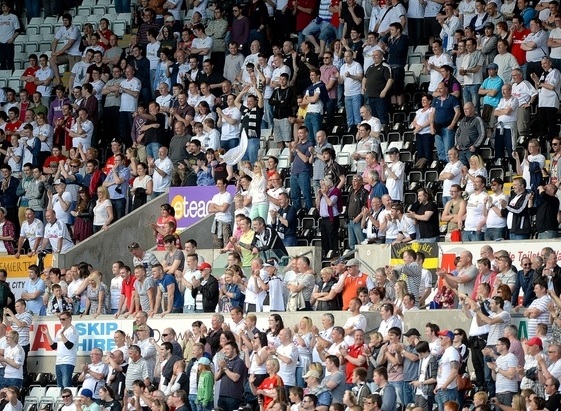 C: It's a great advert for Swansea City isn't it? Such a gripping, almost fictional storyline! K: I think it's great for the club and introduces us to an international audience. It tells the story that shows that we have not forgotten those who are hugely responsible for saving this club. There were some ugly, dark moments during the Tony Petty period and we fought through. I also think it's a very funny film and very emotional. But the story hasn't finished yet – there's a greater story still to be told! C: Sticking with film, you were part of Barclay's Spirit of the Game heroes and starred in your own short video for them last month. Tell us about that? K: Well it's a bit embarrassing really. I was aware something was going on since last March. I had a few phone calls from Barclay's asking for an interview and we did that, then they asked if I would take part in their podcast - again something I happily did. But then I was getting more phone calls and more interviews, asking more questions, so I said to the guys at the Liberty “do you know anything about it?” but they said no. Then, after hearing Barclay's wanted to do some filming with me for the Stoke game, I had a phone call explaining what it was all about and that they were making four short films about passion in football. It was all very humbling - there are so many people who do so many things, but I am the guy the club suggested for it. C: And that led onto the signs flashing around the sides of the stadium on match days that say 'Thank You Kevin Johns'? K: (Laughing) A friend of mine who I've not seen for 30 years, who works in the British Embassy in Bucharest, sent me a screen shot of the television and said “I'm just watching the match in Bucharest, and look what I see!” Those signs are quite humbling and quite nice. My mum and dad were very proud, and I'm happy for them that these nice things happen. C: You do have a reputation for being ultra passionate about the club, so you deserve it. K: I'm just a Swansea City fan. I'm just a supporter of the club who's been given the opportunity to serve the club and do what I do. I still have a season ticket. I was actually asked a few years ago, when we were in the Championship, if I would be interested in doing what I do for a Premier League club. An agent rang me to see if I was interested but I said no I'm not, only because I think a real supporter needs to do that job. I have no second team, I am a Swans supporter – always have been, always will. C: Moving onto what's been happening on the pitch and the Swans seem to be doing brilliantly at the moment. Garry Monk is clearly the right man for the job. What's gone right this season? K: I think there seems to be a great team spirit there. In the Arsenal game – in an age where we talk about the salaries the players are on and some of the negative aspects of their lives – I watched a team play for the shirt. They were playing for the badge. And Garry Monk is a Swansea City man, and there are people like him – Alan Curtis and Kristian O'Leary – all in the dressing room, motivating the players. All are passionate about the Swans. I never doubted that one day Garry would be involved with coaching and management with the club. But I didn't think it would happen so soon. C: I guess no-one expected it to happen that quickly did they? He was just thrown into it. K: No, it happened much quicker than we thought, but I have no doubts that he's the right man for the job. And of all the managers we've had though the era of success, it's the new, young managers that have done the best job for us. Brendan Rodgers, Roberto Martinez, and now Garry - all are guys who have punched above their weight and succeeded. C: I couldn't have put that better myself! Now, Man City on Saturday – do you think we'll come away from the Etihad with something? K: Well I believe anything is possible now. To be honest with you I think why I get so disappointed when we lose is because I never actually think we are going to lose! I expect us to win every game. When we looked at the fixtures at the beginning of the season we kind of thought “oh we've got a run of easy games there,” but they're actually not easy games because teams like Stoke, Newcastle and Sunderland will all be saying “Swansea is a game that is winnable for us.” They have the same mentality as we do. I also thought “Everton, Arsenal and Man City – that's a tough run,” but we've picked up four points so far and I'm thinking now that if we only get four points from these three games I'm okay with that. But I also think that Man City have had better times, it's a different Premier League this year, so anything is possible. I don't think we are anybody's whipping boys. I think we'll come away with credit and the supporters will have seen a good game of football. There's a great team spirit, so there's no reason we can't beat Man City. 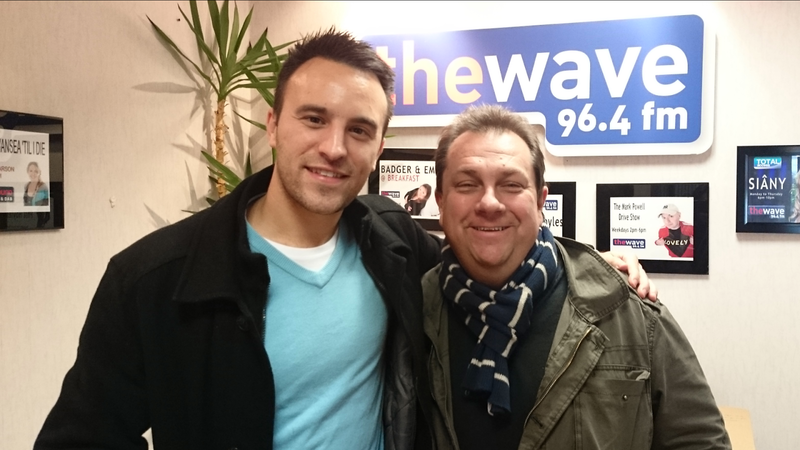 Make sure to get to this year's panto at Swansea Grand Theatre to catch Kev in action on stage! You can follow Kev on Twitter and keep up to date with all Forza Swansea news on my Twitter page. Cawl, mining and dogs... Are YOU the average Swans fan? Do you like cawl? Follow Jim Carey on Twitter? Drive a Nissan? Then, congratulations - you are the typical Swans fan! The South Wales Evening Post published an article earlier today outlining the results of a YouGov survey, which essentially delivers a snapshot of what the typical Swans fan is like. Which one of these drives a Nissan...? Apparently, among other characteristics, the typical Swans fan - let's call him Jack - will be a male who is over sixty years old, works as a miner and likes to eat cawl. Jack will also be interested in personal finance, will be a customer of Swalec and would drive a Nissan. Of all the Swans fans I've ever met it's safe to say that - like snowflakes - no two are exactly the same, but this may shed some light on what makes us tick. Check out the full article on the Post's website, which gives the complete results and a little more about the survey. Go on, find out whether you are a typical Swans fan or - like me - not. Let us know in the comments box below or via Twitter! Every Swansea City fan has their opinions when it comes to foreign investors' interest in the club - "Yes it's a brilliant opportunity" or "No, not now, not ever". 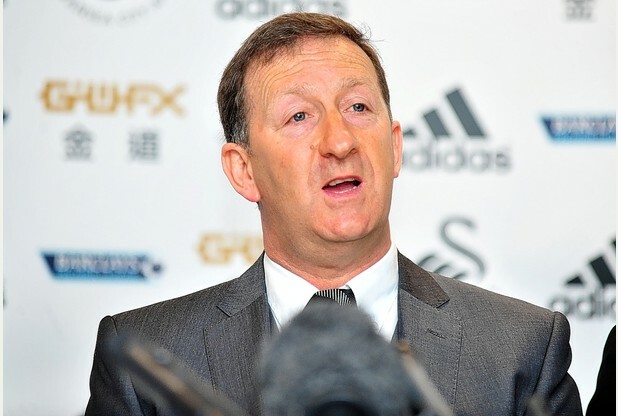 We're lucky to have Forza Swansea's ALEC JOHNSON - a man always in the know - here to explain why accepting the investors is actually a great move for the Swans. Most debates surrounding Swansea City right now all hover around the subject of international investors - do we stick or twist? I'm definitely in the twist camp. Let me sell you the benefits of not just accepting the opportunity, but also embracing it as an exciting development. Firstly, this cannot be compared to Cardiff or Birmingham takeovers, where complete control is handed over to a foreign loony and the board had no choice but to save their club. Also, comparisons have been made to previous American ownership in the shape of Liverpool and Man United where the club has been used to saddle the debt of purchase within the football club. This practise is illegal in mainland Europe, so by nature this attracts foreign investors to our shores. This is because leveraged debt is legal in the UK and, despite decades of profit at these clubs, they carry the debt of their owner's loans. Our position is entirely different, and while we don’t require external investment to survive we certainly need it to grow. There are also many benefits to a wide group of shareholders with minority interest in any business, particularly when the investors span different backgrounds and geography. Tapping into the new circles of corporate America or China elevates us to a new league and securing our financial future in the process. Also, we are not talking about bankers or miners here - the Americans can teach us a thing or two about sports marketing and monetising the asset of sport in the business community. Having run big American sports club for long periods, there is an established depth of sponsorship history that can be exploited together with the brand building exercises for deeper fan bases. The best and most difficult thing in any company structure is to achieve external investment without relinquishing control. Selling a successful business isn’t as difficult as you would think. The board are not going to do that at Swansea City. There is almost an infinite number of private equity groups and family estates that would buy a growing and successful company. The number of groups interested in large investment without control is tiny by proportion. If our board have unlocked that door then they’ve found a golden key for our club. The challenge will be to value the business. Typically a multiple of the recent trading year's profit is considered, with ten being the typical multiple to determine value. Given the published profits are around £15m per season, the club is worth approximately £150m. However a premium is placed on the growth potential and balance sheet. I would argue that Swansea has enough bling and potential to attract a multiple exceeding ten but most investors want control to pay more. They won’t get control at Swansea. What they have is a route into the glamorous showcase of the Premier League. This is what Usmanov has at Arsenal - trophy ownership and an investment in a club that he can attach himself to. Other investors merely want a return in dividends or future share sale. I suspect this would be the motivation of any minority investor in Swansea and that’s fine by me. On an emotional level, the chips are high for our club. Four years of Premier League, profit, stability and debt free. This results in an all-time high for their relatively modest investment of £50k each to save our beloved club just over a decade ago. Who can begrudge them of a pay day that can help secure their personal future? Yes they have a duty to the fans and have a social responsibility that they take very seriously. Diluting their personal shareholding is totally acceptable. They will not leave us exposed in any way - while money changes things, it won’t change their love for the club. Meanwhile the tension between investment into the squad and the stadium is a healthy one. Both need constant investment and history suggests a budget of around £15m per season into the playing staff. This is the approximate budget required for the club to accommodate the next batch of fans waiting to join the Premier League bandwagon through expansion. Are they glory hunters? Quite possibly. But Swansea need to invest in a whole generation of future fans, converted to the club for life, like ourselves. It’s an investment into the next few decades. The seats will sell out given the relatively modest addition to the capacity. The best players also want to play in the best stadiums. Our Liberty needs that third tier. So fast forward nine months - the cranes are up, finishing off our shiny new East Stand but the squad hasn’t changed. Cue the calls for player investment, but the £15m has gone into the stadium. A few injuries and we slide down the table. Monk is under pressure and the board start taking a few bullets. This scenario scares me a lot more than having some American billionaire investing into our club, making us stronger in every way. Every way besides the romantic notion of complete fan ownership, which is pretty much where we are today. It’s served us very well for the past decade but we’re in a different universe now. Stick or twist? Visitors to Swansea are welcomed by the message ‘Ambition is critical’ and we need to remind ourselves of this message. This is a time for us all to let the head rule the heart! Christmas is coming - now is the time to buy your copy of Swansea City's Greatest Games - out now worldwide on Amazon, or in Waterstones, WHSmiths, Tesco and other good bookshops.